Adam Sandler is making headlines and no, it's not because there are a bunch of people on Twitter complaining about the fact that Netflix has greenlit six more Grown Ups sequels. It's because the Saturday Night Live alum will be hosting the show for the first time since his departure from the program in 1995. 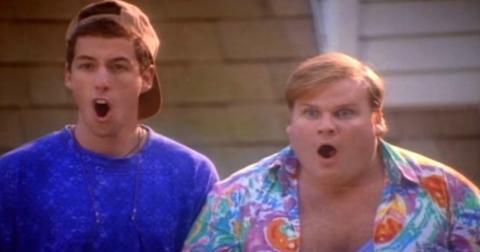 In the '90s, there's no doubt that the faces of SNL were the late Chris Farley and Adam Sandler. In David Spade's wonderful piece where he delineated the origins of his beef with Eddie Murphy, David talked about the effect Adam had on audiences and cast members whenever he'd just start tuning his guitar. Was Adam Sandler fired from SNL? While it seems crazy that the undisputed king of '90s and early 2000s comedy would ever be fired from a TV program, Adam pretty much confirmed that both him and Chris Farley were released from the show amidst falling ratings and a radical decision to shake things up for viewers, which ushered in a new crop of talent in Will Ferrell, Darrell Hammond, Cheri Oteri, and Chris Kattan. "Yes, we were [fired]. We kind of quit at the same time as being fired," he told The Daily Beast. "It was the end of the run for us. The fact that me and him got fired? Who knows. We were on it for a few years, had our run, and everything happens for a reason. We kind of understood because we did our thing. It hurt a lot at the time because we were young and didn’t know where we were going, but it all worked out." Luckily, we have some memorable characters and songs to remember Adam's time on the late night sketch show, including Opera Man. Adam was a huge fan of musical comedy, not in a show-tunes, toe-tapping broadway style, but the man loved whipping out his acoustic guitar and singing some beautifully weird and hilarious songs. A huge hit was Lunch Lady Land, a track that he performed with Chris Farley, who, dressed like a cafeteria server from everyone's public school ever, absolutely killed it with audiences and is still a favorite today. If you've ever watched a single Adam Sandler movie, then you'll know that the man is no stranger to some pretty off-kilter and weird comedy. Opera Man is one of those characters who'd show up on Weekend Update and leave audiences simultaneously laughing and scratching their heads. Adam's greatest musical hit, however, came in the form of a famous holiday song that celebrated Chanukah. There's plenty of Christmas songs, and a lot of them were mega hits, but what about the Festival of Lights? Why hasn't Chanukah gotten it's own radio play? That's what Adam probably asked himself before he penned the smash hit that was on radio stations everywhere. Adam's decision to host SNL may come as a surprise to many, mostly due to the fact that when once asked if he'd ever come back and host the show he reportedly said, "Why should I?" There were reports of some "rancor" that both Chris and Adam had towards the show, and rightfully so. It's not as if they weren't talented, the two men went on to have astronomically successful careers immediately after leaving the show. Watch Adam (and fingers crossed Opera Man) make his big comeback to SNL on Saturday May 4 at 11: 30 p.m. on NBC. Born On Sept. 9? You Have Plenty of Company, Since It’s the Most Common Birthday in the U.S.